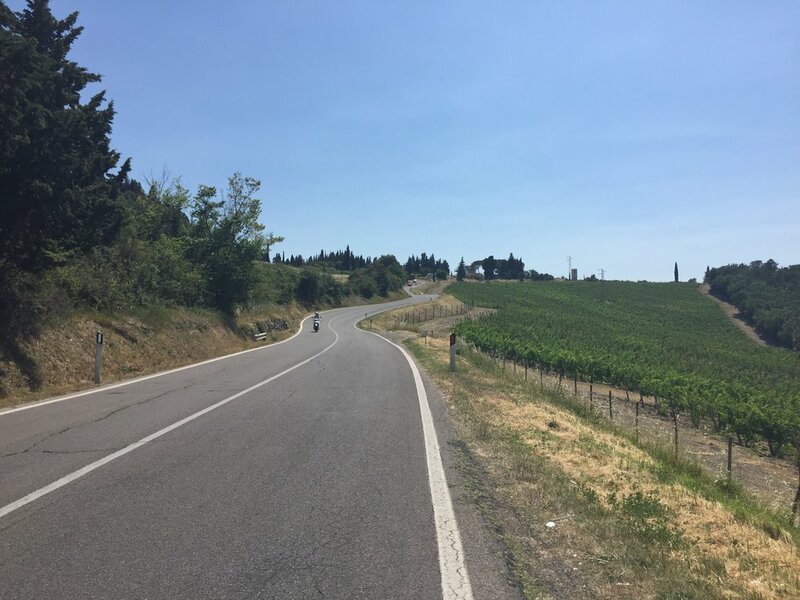 Day 4: Sasso Marconi- Poggibonsi, 100 miles To sum up today in one word I'd go for brutal. But a one word blog would be a bit dull, so I'll expand a little. Hot and hilly would also do the trick. But that's only three words. Friendly Italians must feature too. Sergio jumped aboard the MurrayBrown express, which wasn't travelling quite so fast up the hills. But he seemed content to tag on for about 20 minutes. With our limited Italian and his limited English we chatted enough to find out he was old- his words-he said he was Vincenzo Nibali and Rich was Tom de Moulin. Turns out he also knew a shortcut as he disappeared for 15 minutes, only to be waiting for us up the road! We said our goodbyes and Clara continued to impress going upwards. After two hours of climbing straight after clipping in at 0825, I was screaming out for more food. One huge slice of pizza later I was sorted and ready to carry on climbing. We seemed to spend a lot of the day going uphill. And melting. We traversed our way through Florence which was apparently 40 degrees today. I feared for my life on a few occasions amongst the mopeds, smog and car drivers. Not to mention other cyclists. We found a quieter spot for a quick bite to eat but we were worried we were very behind schedule. So we didn't see much of Florence and hurried on. How one street can make such a huge difference. 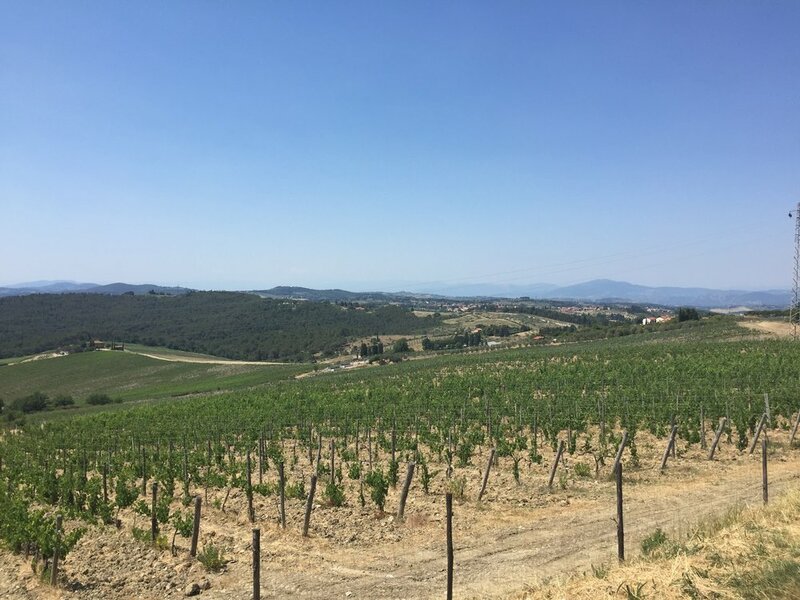 We took the road towards Greve and wine country and suddenly we seemed to be a world away. But more hills!! And so little shade. It was tough going. 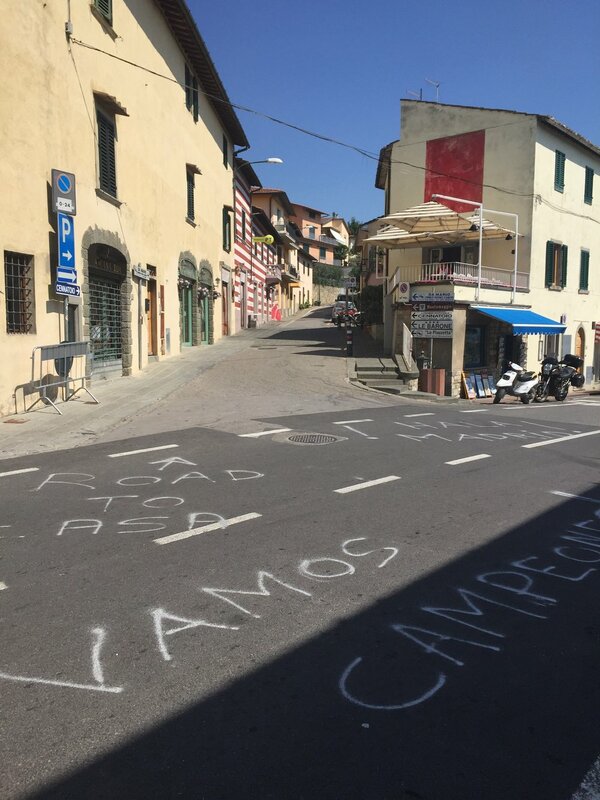 Then we saw chalk on the road and other signs that the Giro had been through. This made me feel slightly better- the pros probably eat hills for breakfast, lunch and dinner. We just have them as a snack now and again. But you know you will eventually reach the top if you keep turning the pedals. 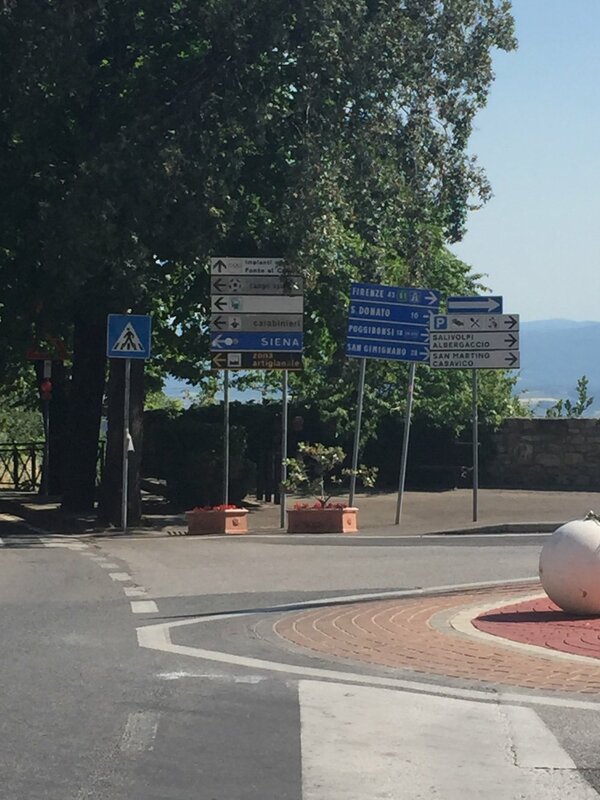 We actually let out a shriek of joy when we saw a sign for our final destination, Poggibonsi, just 20km away. But we thought it'd be another hour of climbing. Two kms further down the road and we were dripping and out of water. We stopped at a pizzeria to refill and in some dodgy lingo I said we were happy we only had a little bit to go. She told us it was all down hill and we actually did a high five right in front of her. We were a little bit happy about that! So a downhill finish to end a hard but rewarding day. The happiness didn't end there. 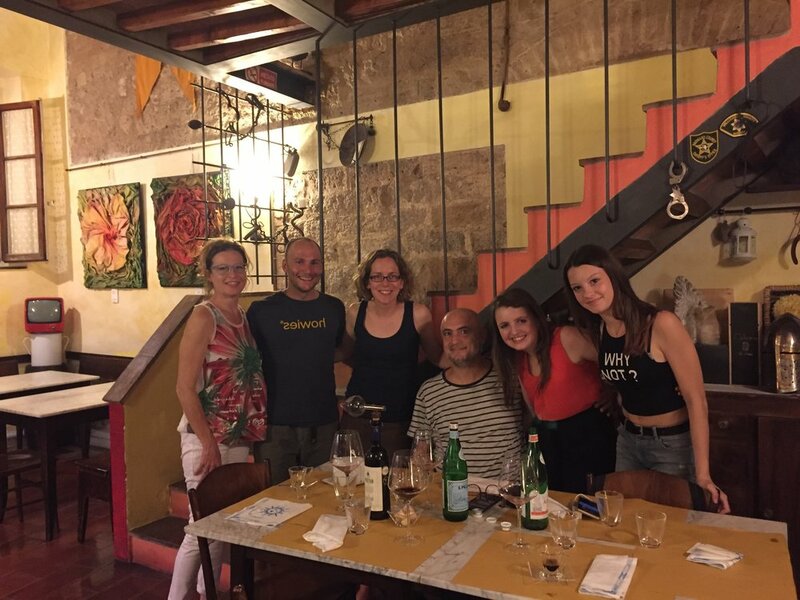 We are staying with wonderful friends of friends, Franca and Sandro, who took us out for dinner to San Gimignano. What a magical place! Today's food: yogurt, some granola, one apricot, handful of cherries, toast and jam and an espresso for breakfast. Slice of pizza and a banana mid-morning. Tuna, egg and salad sandwich for lunch and a lemonade. Ice cream stop mid-afternoon. One tribe bar, one Actisnack bar. 750ml: we were getting through at least this much water every hour, more like 1l. 7.03: the time in hours and minutes my Garmin lasted. We were in the saddle for about another 80 minutes. 1: the number homicidal white Fiat Panda drivers that tried to cut us up. 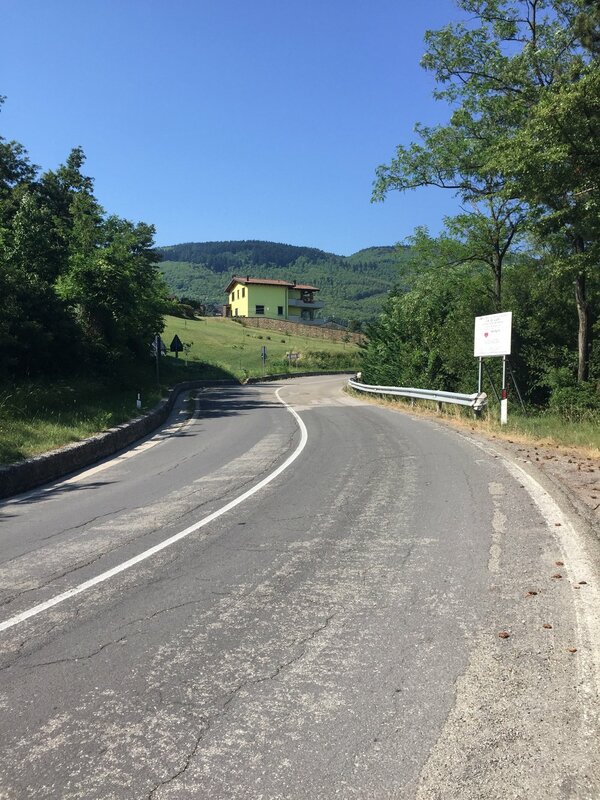 4: the number of cars that passed me on the 18km downhill stretch to Poggibonsi. 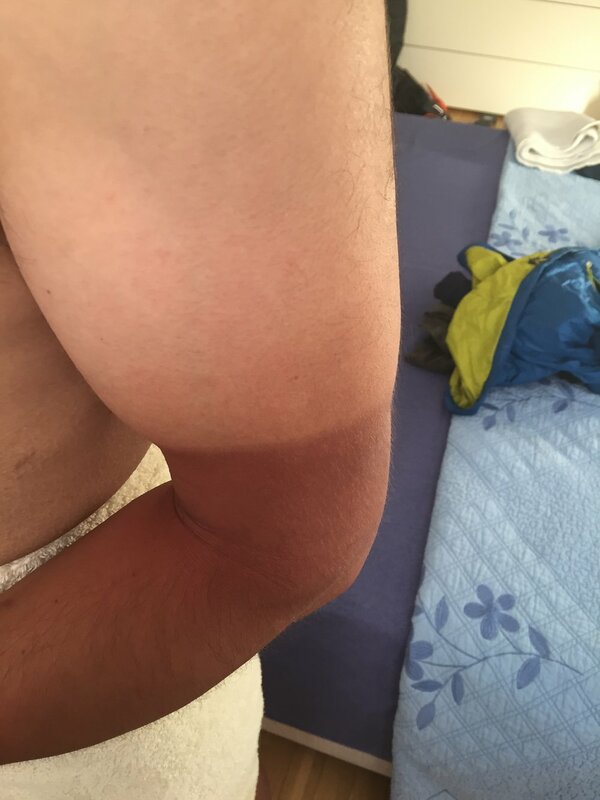 Do Italians get tan lines this bad?! ?